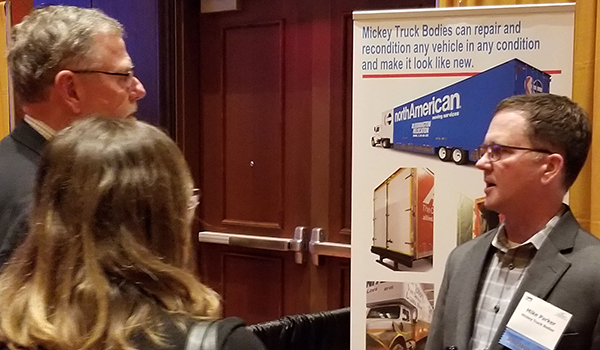 Mike Parker, General Manager of Mickey’s Midwest Reconditioning & Service in Bloomington, IL (at right in photo), speaks with attendees at the 2018 Illinois Movers’ and Warehousemen’s Association Convention. “It was a great education for me to hear first hand Mickey Truck Bodies can best serve the needs of the moving companies in this market,” says Mike. Mickey’s four regional Reconditioning & Service Center (IL, NJ, NC, FL) handle everything from major overhauls to minor cosmetic repairs for all makes and models of moving bodies, as well as free on-site estimates and fleet appraisals. Click HERE for more information on Mickey’s reconditioning capabilities.